It was so nice to wake up to the Etsy Finds newsletter this morning and find my recipe cards were not only on the list, but the main item used for the header. So awesome! A special thanks to Mary from Etsy for putting me on the list, (thank you!). Here's a screenshot, and below that there's a link that will take you to the actual article + a lot more Etsy Finds to look through. Enjoy! I just listed these two gift sets in my etsy shop. Go see for more info! I have been 'tagged' by Celeste Frittata! If you're not sure who that is, here is her blog and here is her Etsy shop. She hand-makes these awesome looking books based on subjects and things from Harry Potter, which I adore. They are hand bound, have hand torn pages, and aged by hand and printed by hand. Amazing stuff! Go check her out! Especially if you love Harry Potter... you'll want to buy one of everything. My favorite right now are her 'Herbology' and 'Potions' notebooks. 1. Until 4 months ago, I had never had my hair colored. 2. Everyone thinks I am still in high school, unless they know me, because I look so young. I'm in fact 24. 3. When I was 11-12 years old after school I would stay at the the clinic where my mom worked as a nurse. The doctors let me paint murals on the walls of the clinic's rooms and hallways. The last one I remember doing was a Dr. Seuss character. 4. I played drums for about 6 years. I stopped because of apartment living. I still have my drums. 5. When I was a kid, I used to dumpster dive for the thrown out flowers behind a flower shop that was across the street from my house. There were always really nice flowers in there! 6. I have a coin collection. 7. My favorite places to shop are thrift shops, used bookstores, flea markets, yard sales, target, and ikea. I just started getting a shop going on Shop Handmade, a new website for buying and selling handmade goods. Shop Handmade is a little different. First off, listing is free right now, and so is selling, that may change in the future, but right now you have the option of giving a percentage or a set amount of your profits to help the environment. I think that's pretty cool. Stephanie at Briones & Co is having a storewide sale now thru Friday, Oct 17th! Get 15% off on your entire order, including shipping and clearance items! (15% will be refunded back to you after purchase) Check out the new mini-meal planners while you're there! 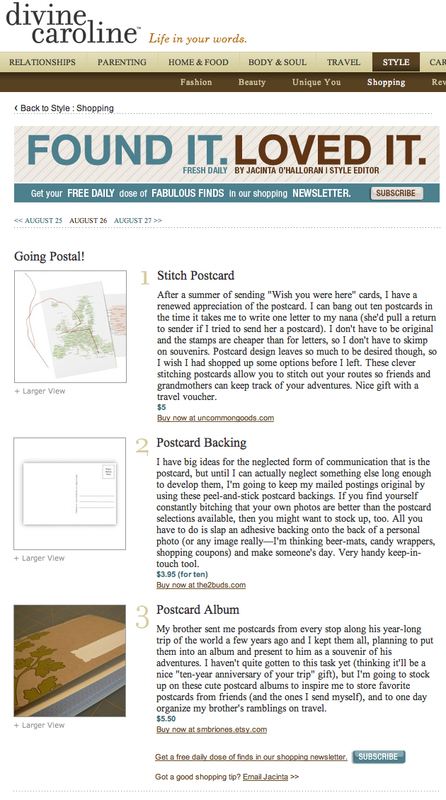 Jena at Modish was kind enough to put my sale up on the Modish bulletin board! Thanks, Jena!